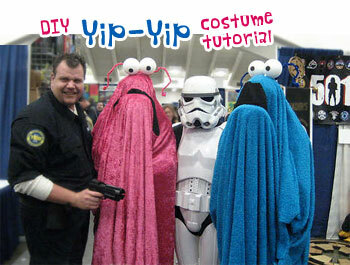 Below are some more completed DIY Yip Yip costumes for inspiration. Like the first image shows, this makes an easy group costume idea since you just need to choose different color “fur” for everyone. When making several at one time should be easy to set up an assembly line style of production. Although the idea comes from a kid show, this is definitely an adult costume due to the visibility. The black mouth opening uses some semi-sheer material that allows the wearer to see without showing his face. Looks great, but could impair your vision a bit especially at night. The material and flowing shape also mean that it will make a great choice for those cold fall nights and as a Halloween costume idea for pregnant women. Yep yep! Subscribe to comments with RSS or TrackBack to 'Yip Yip Costume Idea'.